After last weeks pedicure fiasco, I'm finally starting to feel like myself again. For those of you who don't know what I'm talking about, well I went to pamper myself last week with a mani/pedi. As I was sitting in the pedicure chair, relaxing, the manicurist just got finished painting my fingernails, and it hit-NAUSEA. I threw up all in the tub where my feet were; I had no time to move my feet, because it hit so fast. The ladies were so nice and offered me crackers and water, but nothing will take away the embarrassment. Now I can laugh about it, but I feel so bad for the little girl that had to clean up my mess. I offered to clean it up, but they insisted that they would. Season chicken breast with salt, pepper, garlic powder, onion powder, and dill weed. Boil pasta. While pasta is boiling cook chicken on the stove top in a little olive oil and lemon juice-about 2 tbs. of lemon juice. 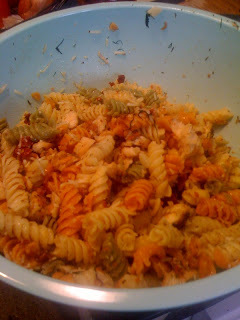 Once pasta is cooked drained and place into a bowl. Once chicken is completely cooked chop into small pieces. Add chicken to pasta. Next take about 5 sun-dried tomatoes and slice into small pieces. Add to pasta. Add fresh dill to pasta, as much or as little as you like. ( I like a lot). Add bacon pieces, again, as much or as little as you like. (My husband wouldn't like this recipe without the bacon.) Toss the salad, then add olive oil, and toss. Lastly add the shredded Parmesan cheese and toss again. You can either eat warm or chill and serve at room temperature. Sounds yummy. I am going to have to try it!